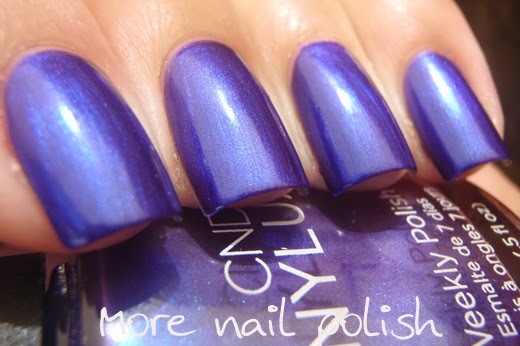 Online store Beyond Polish recently sent me some CND Vinylux polishes to review. I had read a bit about CND Vinylux polishes online, so I was excited to try some out. From the literature I read online, you can get week long, chip free wear from Vinylux polishes, but the important thing is to use 'their system'. The system involves cleaning nails, using a Vinylux colour and then using the Vinylux Weekly Top Coat. The problem for me was the I was sent three shades of colour and no Weekly Top Coat, which meant it was pretty damn difficult to test out the longevity of these polishes. I ended up doing swatches without top coat for the three polishes, and continued wearing the last polish to see how it went without the weekly top coat. Sadly, without using a top coat, the polish remained dentable and soft for at least an hour. In which time, my nails looked pretty messed up. I applied the polish about 2.00pm, and removed it that night. I'm disappointed I wasn't able to try out the full system, because the colours I was sent were really gorgeous and definitely all colours that I would wear. 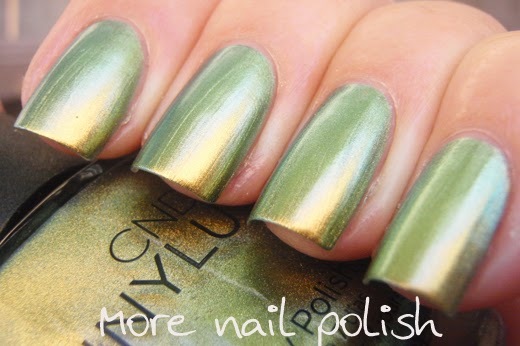 Gilded Pleasure - a fabulous version of the the golden green duochrome made famous by Chanel Peridot. 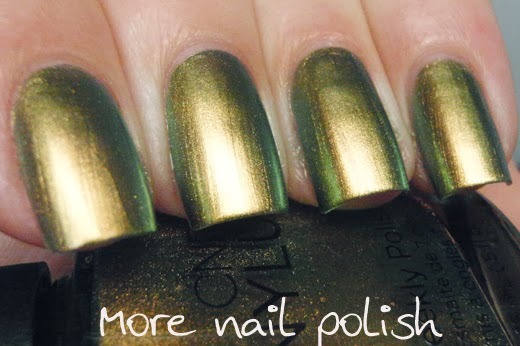 This version of the shade is really pigmented and nearly a one coater. Plenty of colour shift and completely different looking depending on the lighting. Strawberry Smoothie - definitely a shade that my Nana would have loved. A pale pink pearlesent finish. Pearlesent and frosty finishes get so much hate these days and they have really fallen out of favour with most people. But I have to say that I totally understand the true love that some people have for these sorts of polishes. I was expecting to hate this, cause it was frosty and showed some streaks, but I wasn't feeling the hate for it. It was pretty, soft and delicate. I did two coats here and you can still see a light nail line. 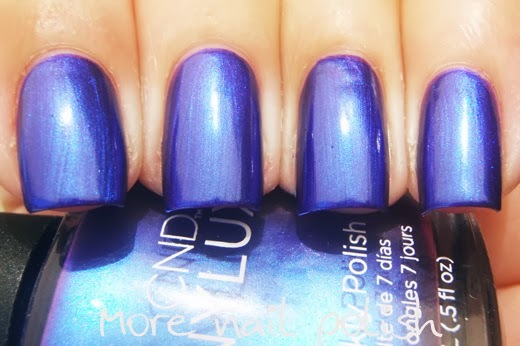 Purple Purple - magical purple base with a heavy blue shimmer. 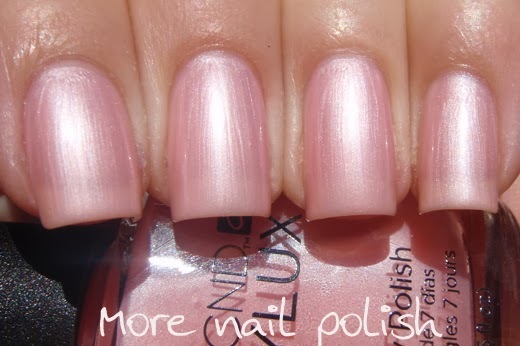 I have a similar polish colour from brand Satin, but that one is watery and needs about four coats. This one is well pigmented and an easy two coater and I absolutely love it. Sometimes it looks more purple and other times more blue. In hindsight, I should have just used Seche Vite and tested them out with regular wear. But I didn't because their brochures say not to use a different top coat. So my recommendation if you want to try CND Vinylux is to remember to get the Weekly Top Coat too. Beyond Polish, located in the USA, have a great range of nail lacquer brands, including China Glaze, Essie, Jessica, OPI, Orly and Zoya, as well as the CND Vinylux range. They also stock a big range of brand name gel polishes and acrylic supplies. The topcoat is so, SO good, and really does make the system. But regardless, you should try to get ahold of the topcoat, because it's like a much better version of SV. SO good! Thanks Veronica - I think I will have to find some of the top coat, just so I can really try these out properly. Thanks for the rec.